Muhammad Ali (born Cassius Marcellus Clay Jr.; January 17, 1942 – June 3, 2016) was an American boxer. He became one of the most famous boxers in the world with his "rope-a-dope" technique. He was also well known for his clever rhymes. In 1999, Ali was named "Sportsman of the Century" by Sports Illustrated magazine. He won the World Heavyweight Boxing Championship three times. Ali also won an Olympic gold medal for boxing during the 1960 Summer Olympics in Rome, Italy. Ali was born in Louisville, Kentucky. 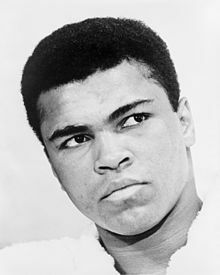 He was named after his father, Cassius Marcellus Clay Sr. Ali changed his name after converting to Nation of Islam in 1965. Because of his Islamic beliefs, Ali would not fight in the Vietnam War when the army tried drafting him. This made him an international figure around the world. Ali retired from boxing in 1981. In the early 1980s, it was found out that Ali had Parkinson's syndrome. He became well known for his social work and charity. ↑ Thomas Jr., Robert McG. (September 20, 1984). "Change In Drug Helps Ali Improve". The New York Times. pp. D–29. Retrieved March 19, 2009. ↑ "Muhammad Ali hospitalized with pneumonia". The Journal.com. Retrieved December 21, 2014. ↑ "Boxing legend Muhammad Ali in hospital after being found 'unresponsive' at his home". Mirror.com. January 15, 2015. Retrieved January 16, 2015. ↑ "Muhammad Ali back in hospital after he was found 'unresponsive in his bed' - just days after the boxing great's 73rd birthday". Daily Mail. January 15, 2015. Retrieved January 16, 2015. ↑ "Ali out of hospital in time for 73rd birthday". MSN.com. Retrieved January 17, 2015. ↑ "Muhammad Ali dies". The Sydney Morning Herald. 4 June 2016. Retrieved 4 June 2016. This page was last changed on 3 February 2019, at 22:05.